OBJECTIVES: This study evaluated outcome in patients with small bowel neuroendocrine liver metastases who underwent liver resection at Groote Schuur Hospital and UCT Private Academic Hospital. METHODS: All patients with small bowel neuroendocrine liver metastases treated with resection from 1990-2015 were identified from a prospective departmental database. Demographic data, operative management, morbidity and mortality using the Accordion classification were analysed. Survival was assessed using the Kaplan-Meier method. RESULTS: Seventeen patients (9 women, 8 men, median age 55 years, range 31-76) underwent resection. Each patient had all identifiable liver metastases resected and/or ablated (median n = 3, range 1-20). Ten patients had major anatomical liver resections. Three patients had five segments resected, and seven had four resected. Nine patients (53%) had a concurrent bowel resection of the small bowel NET primary and a regional mesenteric lymphadenectomy. Median operating time was 255 min (range 150-720). Median blood-loss was 800 ml (range 200-10,000). Five patients required intraoperative blood transfusion. Hepatic vascular inflow control was used in ten patients (56.5 min median, range 20-150 min), which included hepatic inflow control n = 8, total hepatic exclusion n = 1, and selective hepatic exclusion n = 1. Median postoperative hospital stay was 9 days (range 2-28). Thirteen complications occurred in seven patients. Accordion grades were 1 n = 3, 2 n = 4, 3 n = 3, 4 n = 2, 6 n = 1. One patient required reoperation for bleeding and a bile leak. One patient died of a myocardial infarction 36 hours postoperatively. Sixteen patients (94%) had symptomatic improvement. Five-year overall survival was 91% (median follow-up 36 months, range 14-86 months. SBNETs are characteristically well-differentiated, indolent neoplasms, with 5-year survival rates between 57% and 87% reported in patients with localised primary tumours without metastases, and survival rates for resectable metastatic disease confined to regional lymph nodes and the liver as high as 82%.1-3,5,7,9-12 The improved survival in these patients has expanded the indications for surgical resection including palliative surgical resection of hepatic metastases which can confer long term symptomatic relief and with a significant improvement in quality of life (QOL).5,8,13 It is on this basis that an aggressive approach to the resection of hepatic metastases in patients with SBNETs is justified.2 However, the rarity of this condition has led to a paucity of robust survival data, which in turn contributes to a lack of equipoise between current non-surgical and surgical treatment modalities.1,11,12 The aim of this study was to investigate the surgical outcomes of patients undergoing hepatic resection, with curative intent, for SBNET metastases at a tertiary institution. A prospective database for liver resection in the Surgical Gastroenterology and Hepatopancreatobiliary Unit at Groote Schuur Hospital and UCT Private Academic Hospital was used to identify patients who underwent liver resection for SBNET metastases between 1990 and 2015. This is a prospective registered database approved by the University of Cape Town Human Research Ethics Committee (R024/2014) and, in addition, this study was approved by the University of Cape Town Human Research Ethics Committee (HREC Ref: 172/2017). Clinical information was collected from the database, hospital files and laboratory and pathology reports. Patient demographics, imaging studies, surgical procedures (total ischaemic time, estimated blood loss), postoperative morbidity and mortality using the Accordion classification, histopathological details of the resected specimens and outcome were recorded (Table 1). Follow-up was obtained by personal communication with patients and their families and the postoperative follow-up was calculated as the interval from the date of operation until death or 1 July 2017. Imaging modalities used in the diagnosis of SBNET liver metastases in this study included transabdominal ultrasound (US), triple- or four-phase contrast-enhanced computed tomography and octreotide scintigraphy. When indicated, magnetic resonance imaging (MRI) was performed with MRI contrast agents, including gadopentetate dimeglumine (Magnevist®; Bayer Pharmaceuticals) and Gadoxetate disodium (Primovist®, Bayer Pharmaceuticals), used at the discretion of the radiologist. Details of the operative technique have been described previously.14-16 In brief, patients were explored through a subcostal incision positioned and extended in relation to the liver segments to be resected. Intraoperative US was used to define the relationship of the tumours to vasculobiliary structures including portal pedicles, hepatic veins and inferior vena cava (IVC). Mobilisation of the liver was performed as appropriate for the planned resection. The Brisbane classification was used to define the segmental extent of the resection.17 For right-sided sectoral resections and hemi-hepatectomies, the relevant hemiliver was fully mobilised, including exposure of the extrahepatic hepatic veins and retrohepatic IVC. The plane of the planned parenchymal transection was marked on the liver surface using diathermy and parenchymal transection was performed using a Cavitron Ultrasonic Surgical Aspirator (CUSA) (Integra LifeSciences Corporation, NJ, USA). Haemostasis was secured using argon beam coagulation and suture or clip ligation for larger vessels. For formal right or left hemi-hepatectomy, early vascular inflow control was routinely used and selectively for lesser resections depending on blood loss during parenchymal transection. Non-selective inflow control was applied in cycles (application for 20 minutes and release for 10 minutes). On completion the transected liver surface was inspected for bile leaks and sealed using Tisseel®. The resection surface was routinely drained using closed silastic suction drains. Intermittent calf compression stockings and routine pharmacological prophylaxis were used as deep vein thrombosis prophylaxis. Concurrent regional therapy was documented. Statistical analysis was performed using Prism version 7 (GraphPad Software, Inc. La Jolla, CA, USA). A p-value < 0.05 was regarded as statistically significant. Survival was calculated from the time of first diagnosis of hepatic metastases and assessed using the Kaplan-Meier method. Comparisons between groups were conducted with Chi-squared or t-testing as appropriate. Seventeen patients (9 females, 8 males, median age 55 years, range 31-76) were included in the study. Six patients (35%) had undergone resection of the primary tumour (5 small bowel, 1 gastric) prior to the liver resection while in nine patients (53%) resection of the primary SBNET and regional lymph nodes was performed with the liver resection. In one patient who had an appendectomy 25 years previously, no other identifiable primary SBNET was found. The median number of liver secondaries treated was 3 (range 1-20). Tumours were graded according to the TNM classification, in which ten patients had T4N1M1 tumours, four patients had T3N1M1 tumours, one patient had T4N0M1 and one patient had T2N0M1. One patient where no identifiable primary SBNET was found was classified as TXNXM1. 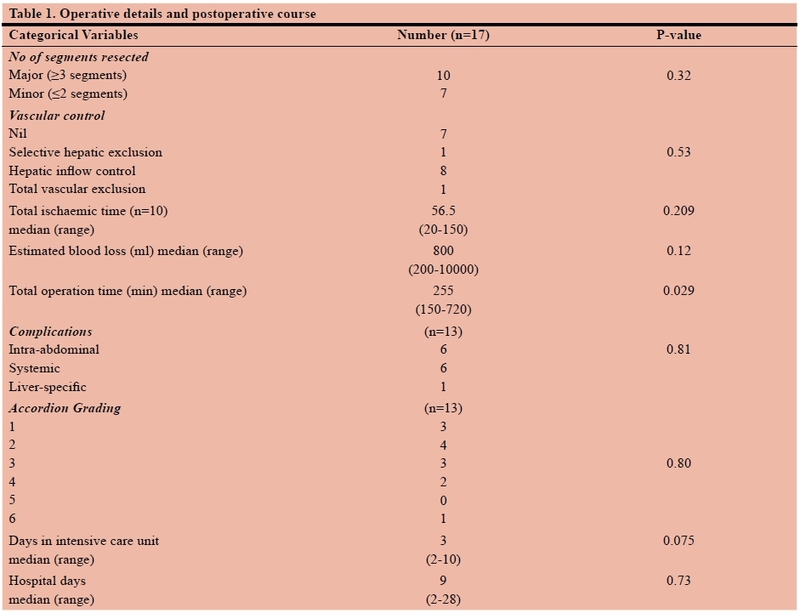 Operative information and details of the postoperative course are summarised in Table 1. Eight patients underwent a right hemi-hepatectomy, six a left hemi-hepatectomy and three subsegmental resections. Two patients had in addition intraoperative tumour local ablation (LA) using radiofrequency ablation (RFA). No patients received perioperative somatostatin infusions. No adjuvant therapy was reported in this cohort. Vascular control was applied in ten patients (median total ischaemic time 56.5 min, range 20-150 min), of which hepatic inflow control was used in eight patients, total hepatic exclusion was used in one patient, and selective hepatic exclusion was used in one patient. Of those patients who received vascular control, nine underwent major resections. Total operation time ranged from 150-720 minutes (median 255 minutes). Median estimated blood loss was 800 ml (range, 200-10 000 ml) and five patients (four who underwent a right hepatic hemi-hepatectomy and one who underwent a left hemi-hepatectomy) required an intraoperative blood transfusion. The median length of ICU stay was 3 days (range 2-10 days) and the median hospital stay was 9 days (range 2-28 days). A total of thirteen complications occurred in seven patients (41%). There were three mild complications (Accordion Grade 1) in three patients (ileus, wound sepsis, confusion). Three patients had four moderate complications (Accordion Grade 2) (delayed gastric emptying, pleural effusion, wound sepsis). Five severe complications (Accordion Grades 3-5) occurred in three patients. These included a bile leak, an intra-abdominal collection, atelectasis and intra-abdominal bleeding in two patients, one of whom required a reoperation. One patient with underlying tricuspid incompetence and right heart failure died 36 hours after surgery due to a myocardial infarction precipitated by a major postoperative bleed. At follow-up, 14 patients were still alive of whom 11 were disease-free. Three patients had tumour recurrence, of whom one underwent reoperation. The overall, 5-year actuarial survival rate was 91% at a median follow-up of 36 months (range 14-86 months) (Figure 1). In the univariate analysis of factors predictive of survival only total operation time (p = 0.029) was found to be significant. For patients with liver metastases from NETs complete surgical resection is the only potentially curative therapy. This study showed that extensive surgical resection addressing the primary tumour, regional mesenteric lymph nodes and liver metastases is justified on the basis of a 5-year actuarial survival rate of 91%. This strategy provides the greatest mean survival benefit, showing 5-year disease free survival rates between 48-87%.1-2·6-7·10-11 All patients in the current series underwent surgery with the intention to remove all tumours. However, the use of cytoreductive surgery has been reported for symptom control and could be considered if more than 80% of the tumour mass can be removed.2-3 An accurate assessment of the extent of liver disease is crucial and preoperative MRI with liver-specific contrast is recommended, as is intraoperative US. Medical therapies, including somatostatin analogues such as octreotide and chemostatic therapies including interferon-alpha (IFN-α) are primarily aimed at symptom control and confer limited anti-tumour effects.5,12-13 Regional therapies include hepatic artery embolisation (HAE), and LA techniques. 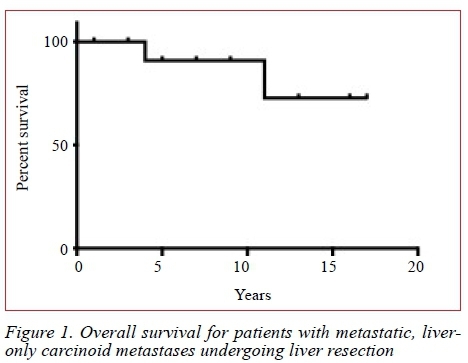 Although LA, including RFA and microwave ablation, are potentially curative, data in specifically NET metastases are limited.2,5,8,13 At present, hepatic resection for neuroendocrine metastases offers the greatest potential survival benefit. An emerging modality, peptide receptor radionuclide therapy using 90Y-DOTATOC or 177Lu-DOTATATE allows targeted delivery of radionuclides to tumour cells expressing high levels of somatostatin receptors. Promising results have been shown both in terms of survival and symptom control in patients with SBNET metastases.19 Wide use of this method, in particular in resource restricted health systems, is precluded by high cost. With regard to indicators of tumour progression, it has been shown by Graaf-Baker et al. that age is a prognostic factor, where it was observed that younger patients have a shorter time to tumour progression and disease-specific death, with a 5-year disease specific survival of 73% reported in patients < 50 years old as compared to 97% for patients 50 or older.3 Our data did not show age to be a significant predictor of survival. Total operation time showed to be the only significant prognostic factor (p = 0.029; CI 95% 19.27-303.7), with days in ICU (p = 0.075) trending towards significance. Although we found that patients with shorter operation times had better survival outcomes, the longer operation time may reflect surgery for a larger tumour burden that per se may influence survival. Of those patients who had 4-5 segments resected, 80% had operation times exceeding the upper 95% confidence interval threshold for survival. Similarly, our data suggest that length of ICU stay is a potential indicator of more severe disease and thus could carry a worse prognosis. This is in concordance with other reports in the literature concerning the outcomes of hepatic resection for neuroendocrine metastases, including that by Que et al. who described that the durability of the clinical response is related directly to the extent of resected tumour and inversely to the extent of residual disease.8 We therefore recommend that extensive surgical resection of hepatic SBNET metastases be attempted should preoperative imaging prove amenable. Limitations of this study include its retrospective design, which lends itself to selection bias, as well as the nature of SBNETs as a rare clinical entity, allowing for the possibility of type 2 statistical errors, in which potentially significant relationships are not identified owing to a limited cohort size. Despite this, we were able to show that length of operation is a significant prognostic indicator of survival and as such can infer that patients with a high tumour burden, as indicated by the number of segments involved, have a poorer prognosis. This, however, should not be used as evidence to restrict resection of hepatic SBNET metastases to those with only 3 or fewer segments involved, as our reported survival outcomes are good enough to justify resection in all patients, regardless of tumour burden. In patients with SBNET metastases to the liver, a substantial number will require major resection, however paucity of solid survival data owing to the rarity of this condition leads to a lack of equipoise between different treatment modalities. We have shown that extensive liver resection can be performed safely in these patients, with good 5-year survival rates. However, the management of these patients is often complex, and thus treatment at a tertiary institute is recommended. The data in this paper were presented at the Surgical Research Society Meeting in Johannesburg in 2017 at which Murray Polkinghorne won the Aesculapius Trophy for the best medical student presentation.